Dutch legend Clarence Seedorf says he is ready to return to management and it would be "an honour" to finally come to the Premier League. The 39-year-old former AC Milan boss has been linked with Newcastle and Championship side QPR in recent weeks. Seedorf told BBC Sport: "England and I have a particular story - I was close to going to play there many times. "It never happened, so as a coach it would be great to experience English football and fans on a weekly basis." In a wide-ranging interview, Seedorf discussed the prospects of Louis van Gaal, Jose Mourinho and Rafael Benitez at Manchester United, Chelsea and Real Madrid respectively, as well as his own future coaching plans. Seedorf, the only player to win the Champions League with three different clubs, was also reportedly close to the Galatasaray manager's job before Mustafa Denizli was appointed this month and is viewed as a potential successor to Danny Blind as Dutch coach. "If there is a good project I would be happy to consider it," Seedorf said. "There are a lot of rumours about my next job but to be linked with important clubs is a nice feeling and it is always better to have options than to not have options at all." 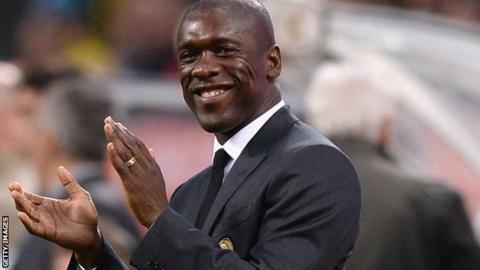 Seedorf's time in charge at Milan in 2014 was perceived to be unsuccessful because it only lasted five months, but his average of 1.84 points per game would have secured a Champions League place over the course of the 2013-14 season. Seedorf: "I have been fortunate to work with many great coaches and also in different countries and I have taken a bit from all of them - Dutch, Spanish, Italian and Brazilian football. "I want a mix of all of that in my team - the good possession and organised football of Dutch school and the attacking mentality of the Spanish. The Italians know how to defend in a very organised way and play for the result, and there is the freedom to express players' talent you have in Brazilian football. "I saw it happen in a few matches when I was at Milan and now I would like to create it on a more consistent basis - attacking football but with a good organised defensive system. "The most important thing for me is to value the players, and try to improve them individually in order to improve the team. "Every player can still grow - there is no limit to that, even when I was 38 I improved myself in certain things and that is what I will always do with my players to help them get the best out of themselves." Van Gaal, who handed Seedorf his first-team debut at Ajax at the age of 16 in 1992 before they won the Champions League together at the Dutch club in 1995, has been criticised for Manchester United's lack of attacking flair this season. Seedorf: "I don't know who is criticising Van Gaal but I am sure that the team is not - they are second in the league. "I don't think he has changed too much since I started working with him at Ajax. He has always had results with his teams, and he has always won things. "You can like or dislike him, and like or dislike his team's playing style but football does not have just one way of getting results - I think every coach has the right to work with his own philosophy if he gets the desired results. "I hope he will continue the way they are playing because they are near the top of the table." Mourinho won two Serie A titles and the Champions League in his two seasons with Inter Milan while Seedorf was a player for his city rivals, the Rossoneri. His Chelsea side are 15th in the Premier League table. Seedorf: "I can just imagine the frustration within Chelsea, especially from the coach. Practically the same team won the Premier League title last season. Seedorf spent three seasons at Real Madrid from 1996 to 1999 and won La Liga in 1997 and the Champions League in 1998. He was named in the Spanish club's 'team of the century'. Real, managed by Rafael Benitez, are third in La Liga, six points behind leaders Barcelona who beat them 4-0 last Saturday. Seedorf: "Like Van Gaal and Mourinho, Rafael Benitez has won some important titles and a lot of experience, and he is at probably the most difficult club to work at as a coach. "Real Madrid has a lot of high expectations, not only in terms of results but also with nice football and a lot of goals. It is a tough place to be but he definitely deserves time, because he has only just arrived and he is actually doing quite well. "Losing at home to Barcelona is hard for fans to take but they have already come back very strongly in the Champions League this week."